What's for lunch or dinner today? 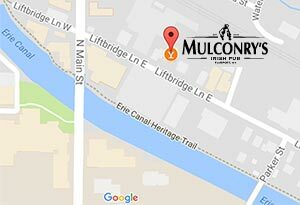 Satisfy your cravings and sate your hunger at Mulconry's Irish Pub and Restaurant. When you've had "one of those days," save yourself the aggravation of preparing dinner by bringing the family to our place! We offer a warm, relaxing and family-friendly atmosphere, tons of good food and drink and you won't have to clean up any mess! Enjoy good food in a warm and welcoming atmosphere with your friends and family today. Even if you have a very picky eater in your group, there is always something on the menu to satisfy everyone! Enjoy American favorites such as burgers or chicken or change things up and try one our traditional authentic Irish dishes!